Twenty years ago, a crisis of Russian capitalism doomed Moscow’s pro-Western regime and gave birth to the Putin era. Though it passed largely unnoticed, this August marked the twentieth anniversary of an event that decisively reshaped modern Russia. There are obvious reasons why Russians wouldn’t especially want to commemorate the rouble crash of 1998. But that event and its fallout had a much more significant impact on the country’s politics, its economy, and its foreign policy than is generally appreciated today. It’s customary to see the presidential handover from Boris Yeltsin to Vladimir Putin on New Year’s Eve, 1999, as the most significant watershed in Russia’s recent history; its status as an epochal shift is reinforced by its coinciding with the turn of the century. But in many important respects, the groundwork for Putin’s rise to power was laid more than a year earlier, in the summer of 1998. Looking back to those events can help us understand what made his long dominance possible in the first place. The rouble’s 1998 collapse was itself a delayed consequence of the Asian financial crisis that had begun the year before. For months, the Russian government struggled to contain the ripple effects from the turmoil to its east. The country was already mired in a deep economic depression that had lasted several years. The aftershocks of the Soviet collapse had been amplified in turn by “shock therapy,” and by the second half of the 1990s poverty and unemployment were widespread, life expectancy had plummeted, and symptoms of social collapse were rife. In May 1998, coal miners blocked the Trans-Siberian railway in several places in protest over unpaid wages, raising the prospect of wider unrest. In the midst of this ongoing national disaster, the Yeltsin administration poured resources into propping up the rouble’s value and kept insisting to international investors and the IMF that it would not devalue. Eventually, though, the pressure proved too much, and on August 17, 1998, the government announced a devaluation, along with a default on domestic debts and a moratorium on external debt payments. Over the next month, the rouble lost two-thirds of its value, inflation spiraled, and unemployment and poverty spread still further. Even before the crisis, millions of Russian workers were going unpaid for weeks or months at a time. After the rouble crash, these zaderzhki — “delays,” though the correct term would be “wage theft” — grew even longer. But for most of the Russian population, the effects of the crisis soon began to subside as economic recovery set in. The 1998 devaluation itself played a role in this: by rendering imports more expensive, it gave a boost to domestic producers. The rouble crisis had other far-reaching effects: by wreaking havoc on banking and finance, it tilted the pattern of economic growth towards other sectors, and away from Moscow, where Russia’s wealth had overwhelmingly been concentrated in the 1990s. These shifts provided the foundations for Russia’s burst of growth in the 2000s, when oil prices began to climb: up to the 2008 global economic crisis, GDP increased by an annual average of 7 percent. They also altered the composition of Russia’s elite. During the 1990s, tycoons such as Boris Berezovsky, Mikhail Khodorkovsky, Vladimir Gusinsky and others had piled up incredible fortunes, thanks in large part to their ownership of banks. But the 1998 crash blew a hole in their balance sheets, and the Russian finance sector never regained the prominence it once enjoyed. The sources of wealth lay elsewhere, above all in the natural resource sector — oil, gas, coal, metals. Oligarchs with holdings in these areas kept their places at the top table. But increasingly in the 2000s it was other names, more often than not from outside Moscow, that appeared in Forbes’s billionaire rankings: the likes of Roman Abramovich, originally an oil and aluminum magnate; Vladimir Bogdanov, owner of the oil company Surgutneftegaz; Aleksei Mordashov, owner of the steel conglomerate Severstal; and dozens more. As this rash of new fortunes suggests, Russia’s income distribution was no more equitable after the 1998 crash than it had been before. Wealth was still being transferred up the income ladder at a phenomenal rate. And as a major oil-producing state, with plentiful deposits of gas, coal, and metals, Russia would have benefited from the post-1999 rise in natural resource prices anyway. But without the 1998 crash, the gains would have been distributed still more narrowly than they ultimately were. Even the modest material improvements ordinary Russians experienced from 1999 onwards contributed greatly to Putin’s subsequent popularity, enabling him to build an electoral base that, for all the rigging that has undoubtedly taken place since then, nonetheless remains substantial. Politically, too, the aftermath of the 1998 crash laid down several important markers for what was to come under Putin. Though its economic effects took time to unfold, the political fallout was more immediate. On August 23, 1998, Yeltsin fired Sergei Kirienko, the prime minister he had appointed only five months before, and set about reinstating Kirienko’s predecessor, Viktor Chernomyrdin — only to meet with unexpected resistance from the Russian parliament. The Duma had previously tended to rubber-stamp Yeltsin’s decisions, a pattern that began in October 1993, when a standoff between the president and what was then called the Congress of People’s Deputies ended with Yeltsin sending in tanks to bomb it into submission. With its powers substantially reduced under a new constitution approved in December 1993, the parliament was fittingly renamed the Duma, after the legislature the tsars had blithely ignored. Once docile, under the crisis conditions of 1998 it suddenly rebelled, twice refusing to confirm Chernomyrdin’s reappointment. Wary of dissolving the legislature and calling new elections, Yeltsin was obliged to install its preferred candidate for prime minister, Foreign Minister Evgeny Primakov, instead. Primakov’s premiership lasted only a few months; having taken office in September 1998, he was levered out by Yeltsin in May 1999. But however brief, his tenure was significant in demonstrating the political strength of a more statist line. A former Pravda Middle East correspondent and KGB foreign intelligence chief, Primakov brought a change of course both domestically and in foreign affairs. As foreign minister from 1996 to 1998, he had turned away from Yeltsin’s reflexively pro-Western stance, seeking to improve relations with China, India, and other non-Western states in a bid to balance against the influence of the United States and its allies. He maintained this stance as prime minister. (His appointment didn’t go down well in the West: in September 1998, the New York Times’s William Safire apparently phoned leading Russian liberal Grigory Yavlinsky to splutter: “Are you guys out of your minds? When Russia most needs the West, you put in a lifelong enemy of freedom?”) When the NATO bombardment of Serbia began in March 1999, Primakov was on a plane to Washington, and immediately ordered it to turn around. This was little more than a symbolic gesture, to be sure, but it’s hard to imagine any of his immediate predecessors, under either Yeltsin or Gorbachev, making it. Domestically, one of Primakov’s first moves was to prioritize payment of wage and pension arrears. He also slowed the pace of privatization, and in early 1999 raised the possibility that previous sales — widely known to have involved all manner of crookedness — would be re-examined, or even potentially reversed. These measures, accompanied by a dose of anti-oligarch rhetoric, quickly earned Primakov enough popularity to make a bid for the presidency in 2000 seem feasible. The idea that Primakov might come to power, threatening the outcome of the 1990s free-market transition, was worrying enough for both Yeltsin and his Western backers. But worse still was the very real possibility that Yeltsin might be prosecuted when he left office. As the crisis-ridden months rolled on, it became increasingly apparent that Yeltsin had to find a successor he could depend on to guarantee him immunity. Putin’s stunning rise to power in August 1999 — the promotion of the little-known head of the FSB to prime minister took everyone by surprise — was engineered by a coterie around Yeltsin with that aim primarily in mind. Not coincidentally, the very first measure taken by Putin upon becoming acting president on December 31, 1999 was to sign a decree granting Yeltsin immunity from prosecution. 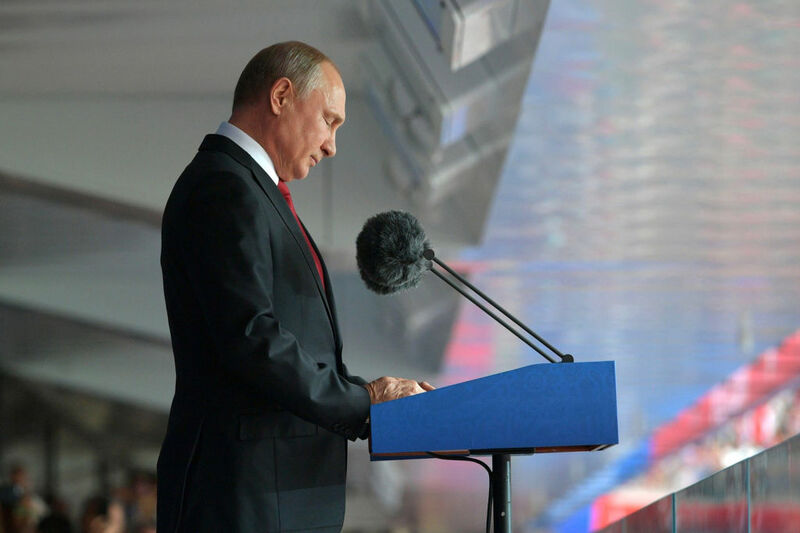 But from the start of his time in the Kremlin, it was clear that Putin represented a new political project — and that he, too, had learned important lessons from the turbulent period that followed the rouble collapse. After 1998, it was no longer realistic to imagine that the previous untrammeled free-market model could simply continue. Some degree of state oversight, especially in strategically important sectors, seemed advisable. Domestically, the times seemed to call for a dash of anti-oligarch rhetoric. In the realm of foreign policy, a stronger defense of Russian national interests made evident political sense. On all these fronts, the policies Putin adopted after 2000 picked up on motifs that had first gained ascendancy in the wake of the rouble collapse. But there were significant and substantive differences. For all Putin’s early talk of “liquidating” the oligarchs as a class, their numbers multiplied considerably during his first two terms: the country went from having no billionaires in 2000 to eighty-two in 2008. And while Putin approved of an expanded role for the state in some sectors, in others he extended the reach of the market, privatizing several more state companies and a range of services in housing and education. On foreign policy, Putin began his presidency with a much more pro-Western orientation than Primakov, even expressing an interest in Russia’s joining NATO. After the September 11 attacks, he offered the US assistance in its “war on terror,” and gladly approved the US establishing bases in neighboring Central Asian states for the assault on Afghanistan. All of this meant there was a tension running through Putin’s early governing agenda, between its statist, anti-oligarchic components and its pro-market, pro-Western ones. To some extent this was a product of the familiar gap between rhetorical promises and policy substance, which the new government was able skillfully to exploit. But there were also genuine ideological contradictions within the regime itself, a dualism in which many of the attributes that had made Primakov popular were combined with an underlying commitment to protect the Yeltsin government’s capitalist reforms. This duality within early Putinism would not have existed were it not for the rouble crash. Seen in that light, the 1998 crisis made the Putinist synthesis politically necessary. Putin has now been in power in Russia, either as president or as prime minister, for nineteen of the twenty years since the rouble collapse. He has come to be so closely identified with the Russian state — even the country as a whole — that the temptation to interpret Russian developments through the prism of his personality has proven hard for Western commentators to resist. But many of the most distinctive features of his rule are not just outgrowths of his individual psyche. They are the result of the dramatic political, social, and economic changes taking place around him. Though it’s become customary to stress the formative influence of the Soviet era on Putinism, the turbulence of the 1990s — and in particular, the period following the 1998 rouble crash — has been far more influential for his political project. It was those events that threw Yeltsinism into crisis, prompting the search for a successor that led to Putin’s elevation. It was in the aftermath of the currency collapse that many of Putin’s key ideological tropes were first successfully deployed. And it was the economic sequels to the 1998 crisis that created the basis for the sustained growth that has underpinned his lasting popularity. In these respects, Putin owes much more to the 1998 crisis than either his supporters or his detractors — equally fixated on the president’s persona — might be willing to admit. Tony Wood is a member of the editorial board of New Left Review and the author of the forthcoming Russia Without Putin: Money, Power and the Myths of the New Cold War (Verso, 2018).